The story begins with our great-grandfather Léon, born in 1879 in Ucel in Ardèche. His father had destined him for the priesthood but Léon was an artist, a man with a passion for painting. In 1901 he met Joséphine and against his parents’ wishes, fled with her to Marseille and then to Tunis. They were married and moved to Paris in 1904. So it was in Paris that by chance, while out walking with Joséphine one day he visited the Salon du Cycle for the first time. It was love at first sight once again. In 1905 he went to work at the Française Diamant, manufacturer of bicycles that were among the most efficient models in France at the time. He became the manager but dedicated all his spare time to painting. Between 1908 and 1911 Léon attended art courses at the Académie Libre d’Henri Matisse at the Couvent des Oiseaux and then at the Hôtel de Biron. There he met André Derain who introduced him to Maurice de Vlaminck. They both shared a passion for painting but above all, a love of cycling (Vlaminck had once been a professional racing cyclist). One day he mentioned that he had always dreamt of building bicycles the way sculptures are made: symbols of freedom. It was Léon who was to make this dream come true. 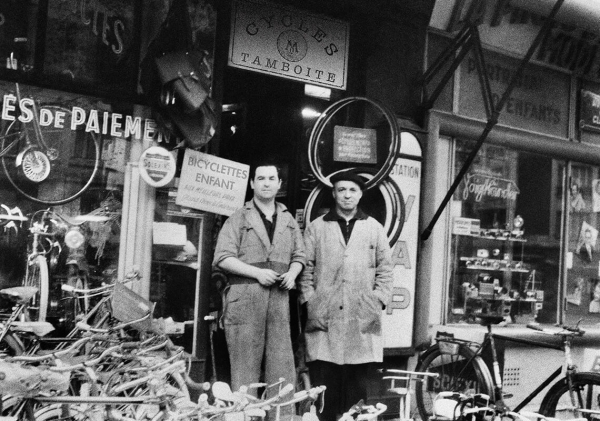 He set up his own business in 1912, rue Dulong, between Montmartre and the elegant right bank, launching his very first bicycle brand: les cycles Rych. 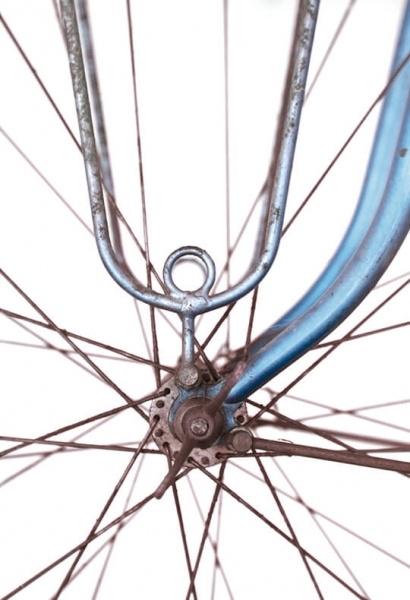 The bicycles were produced in the small adjacent workshop and their craftsmen were artists with a file and blowtorch. The clientele grew rapidly and in 1913, Léon opened a second shop at 31 rue des Batignolles. But then the Great War struck and everything had to start afresh. 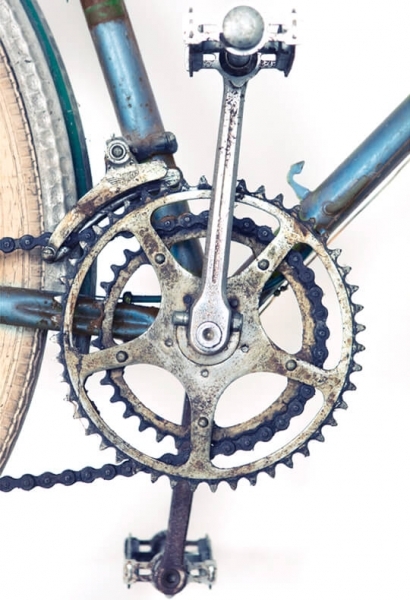 Demobilized in 1919, Léon began again, producing his exclusive bicycles under his Rich brand. Helped by his son Henri, their boutiques on rue Dulong and rue des Batignolles thrived. 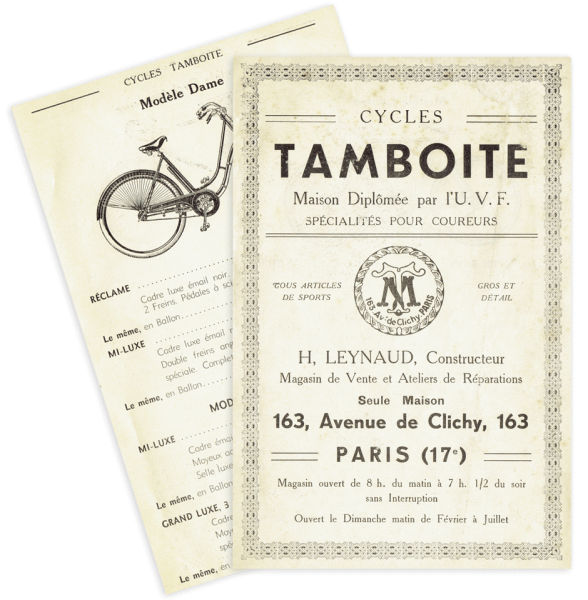 In 1928, father and son, the latter only 18 years old, took over the business of Maurice Tamboite, former star of the Vel d’Hiv and manufacturer of competition racing bikes. This merger led to the creation of the Maison Tamboite. For its Parisian clientele, it combined the old track cyclist’s technique and spirit of competition with the aesthetic research and craftsmanship of Rich bicycles. They opened their workshop at 173 avenue de Clichy. The shop was a little further along at No 163, between Montmartre and Les Batignolles, in the Parisian district of artists and cafés-concerts. Their first customers were found in the neighbourhood. Clichy, at the end of the roaring Twenties, drew a clientele that was often composed of famous figures who combined freedom, style and elegance in a truly Parisian lifestyle. 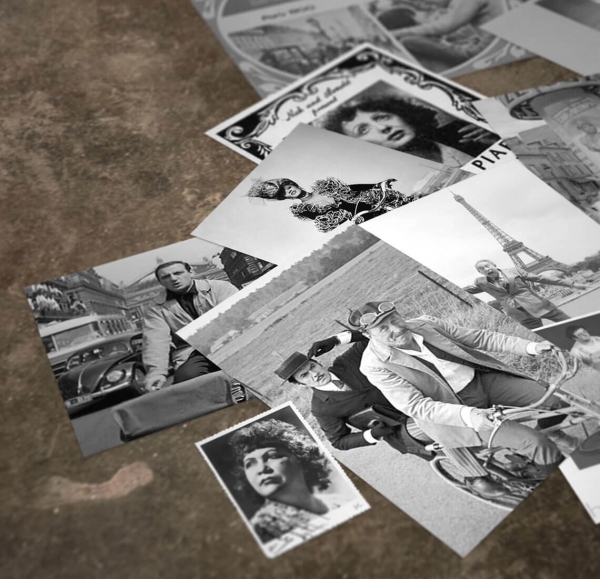 Browsing through the old order books reveals names such as Joséphine Baker, Marlene Dietrich, and Sarah Bernhardt as well as Maurice Chevalier, Fréhel, Charles Trenet, Edith Piaf, Bourvil, Lino Ventura, Coluche and many others. Although during the seventies, the development of industrial bicycle production almost erased the memory of a craft that had existed in France for over a century, the spirit of Léon, Henri and the Maison Tamboite still lives on. It is with great pride that their descendants open the doors of Maison Tamboite Paris at the new address at 20 Rue Saint Nicolas, a stone’s throw from Bastille and in the heart of the Faubourg Saint-Antoine, one of the last bastions of Parisian craftsmanship.